Penn Manor agricultural education teacher Meagan Slates has been named recipient of the Pennsylvania Outstanding Early Career Teacher Award. Slates, who has taught at Penn Manor for four years, earned the award from the National Association of Agricultural Educators. Applicants for the award are evaluated on their teaching philosophy, effective classroom instruction, experiential learning and leadership development qualities. Teachers also are evaluated based on their professional growth and community engagement. Slates is now under consideration for a national award. Slates was selected to represent Pennsylvania by the Pennsylvania Association of Ag Educators. Congratulations, Meagan, on your latest award. 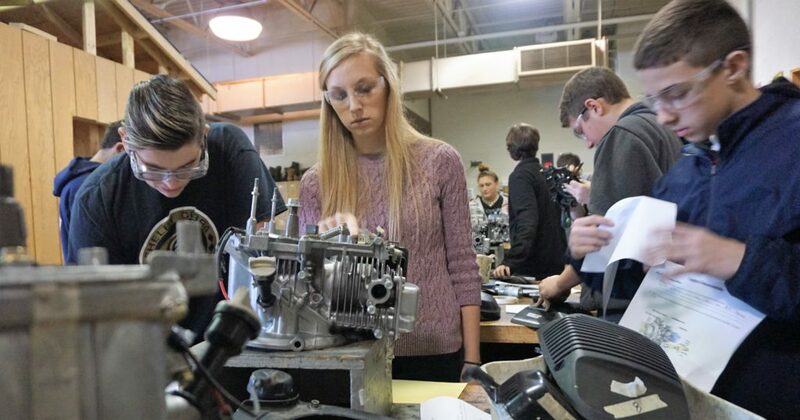 Meagan Slates instructs students in an agricultural small engines lab.